The Government of the day formulates the economic policies and present demands to the Parliament for carrying out the policies. In order to scrutinize the expenditure proposed by the Government in an informal atmosphere disregarding party lines, an Estimate Committee is constituted after the budget is presented before the Lok Sabha. Economy and improvement in organizational efficiency or administrative reform consistent with policies underlying the estimates. Suggest alternative policies for bringing efficiency and economy in administration. Examine whether the money is well laid out within the limits of the policy. 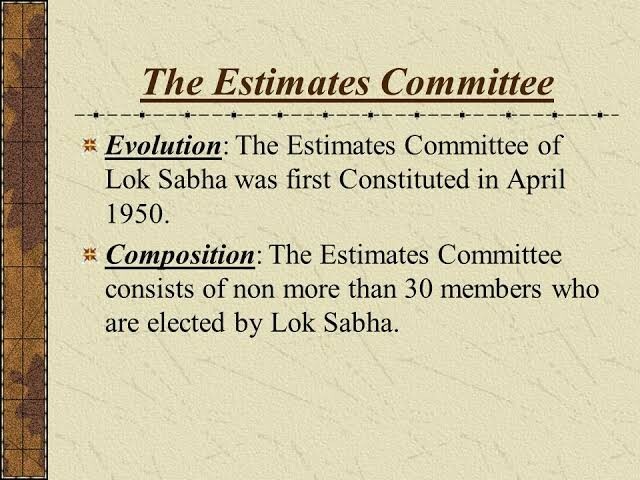 To suggest the form in which the estimates are to be presented to the Parliament. The committee functions would not include a Government undertaking which has been referred to the Committee on Public Undertakings. The committee shall not have more than 30 members. The members are elected by proportional representation by means of single transferable vote. A Minister cannot be elected to the committee and if after election a person is appointed a Minster, he ceases to be a member of the committee. The members are appointed for a period not exceeding one year. The report of the committees is not debated in the House. The committee keeps on working throughout the year and places its views before the House. The demand for grants made by the Government does not wait for the report of the Estimates committee. The Estimates Committee makes useful suggestion and checks Government’s extravagance in making demands for the next financial year. The Select or Joint select Committees on individual bills for investigation or inquiry. The Parliament may appoint a committee for specific purpose of studying a particular subject matter for example, a committee for the welfare of Scheduled caste and scheduled tribes. There are committees to inquire into the various matters like the Committee of Petitions and the Committee of Privileges, the Committee to Scrutinize or the Committee of Government assurance and Committee on Subordinate Legislation. There are also committees of administrative character relating to the business of House such as Committee on absence of Members from the sittings of the House, Business Advisory Committee and Rules Committee. A few committees are concerned with the facilities of a Member of Parliament like the House Committee and Library committee. However, the most important committees include the financial committees such as Estimates committee, Public Accounts Committee and the Committee on Public Undertakings. It formulates Code of Conduct for members and suggest amendments to it from time to time. It also oversee moral and ethical conduct of Members. It examines complaints related to any unethical conduct by members of Lower House of Parliament. It can also initiate suo motu investigation into matters related to unethical conduct of a member and make recommendations, as it may deem fit. The legislative council is permanent body but 1/3rd of its member retire every 2 years. The members of the council elect a chairman which is called “presiding officer”. The council also elects the Deputy chairman. Total Number of the Legislative Council should not exceed the 1/3rd of the total number of members of the Legislative assembly, but it should not be less than 40 (Article 171). Jammu & Kashmir is an exception to this where the upper house has strength of 36 only. This is because; J & K assembly is created as per the J & K constitution and Part VI is not applicable to Jammu & Kashmir. There are only seven such Councils across the country in the states of Andhra Pradesh, Bihar, Jammu and Kashmir, Karnataka, Maharashtra, Telangana, and Uttar Pradesh. Section 168 of the Indian constitution speaks about the Constitution of Legislatures in States and Article 169 speaks about “Abolition or creation of Legislative Councils in states”. Indian Constitution does not adhere to the principle of bicameralism in case of every legislature. Whether there should be a legislative council in the state or not, is decided by legislative assembly of the state itself. But it does not mean that legislative assembly can itself create a legislative council. The constitution of India has full provisions about the creation of legislative council and its abolishment. The power of abolition and creation of the State legislative council is vested in Parliament of India as per article 169. But, to create or to abolish a state legislative council, the state legislative assembly must pass a resolution, which must be supported by majority of the strength of the house and 2/3rd majority of the present and voting (Absolute + Special Majority). Though when a legislative council is created or abolished, the Constitution of India is also changed, it is not considered as a Constitution Amendment Bill. Is there a need for Legislative Council in all the States? The framers of the constitution as well as members of the Constituent assembly had in mind that it may not be possible for all the states to support two houses, financially as well as for other reasons. For instance, some of the members of the Constituent assembly criticized the idea of bicameral legislature in the states as a superfluous idea and a body which is unrepresentative of the population, a burden on the state budget and causing delays in passing legislation. That is why, it was left for the legislatives of the state assembly to decide whether or not there should be a legislative council in the state. An Upper House provides a forum for academicians and intellectuals, who are arguably not suited for the rough and tumble of electoral politics. It provides a mechanism for a more sober and considered appraisal of legislation that a State may pass. Legislative Councils make the governments more accountable. The members of Legislative Council through their experience can act as the friend, philosopher and guide of the Legislative Assembly. The absence of Legislative council in every state itself suggests the lack of any real advantage, apart from the absence of a broad political consensus on the issue. The process of creating an Upper House is lengthy. Two Bills introduced in the Rajya Sabha in 2013 for establishing Legislative Councils in Assam and Rajasthan are still pending, indicating the lack of support for such a move. 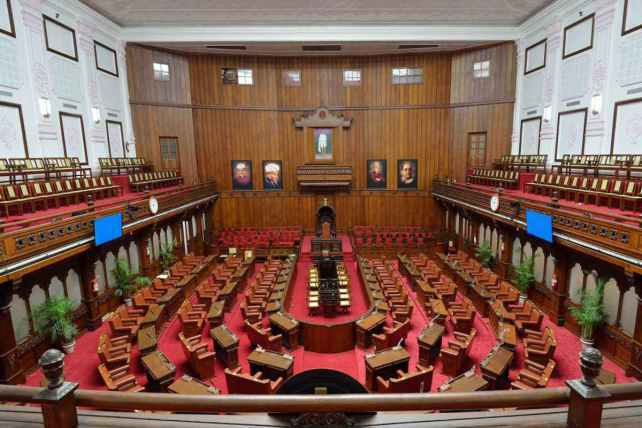 Rather than fulfilling the lofty objective of getting intellectuals into the legislature, the forum is likely to be used to accommodate party functionaries who fail to get elected. It is also an unnecessary drain on the exchequer. Another issue is that graduates are no longer a rare breed; also, with dipping educational standards, a graduate degree is no guarantee of any real intellectual heft. There has to be a national policy on having an Upper House in State legislatures to be framed by the Union government, so that a subsequent government doesn’t abolish it. There has to be a uniformity and strong policy for its creation, revival and abolishment. The provision in the law for Councils to have seats for graduates and teachers needs to be reviewed. A national consensus must be evolved on the establishment of Legislative Councils. The Cabinet Committee on Political Affairs, headed by Prime Minister Narendra Modi, will soon decide on the proposal. A petition was moved in the Supreme Court that Limboos and Tamangs were not adequately represented in the Assembly, and the court in 2016 directed the Home Ministry to take action. The tribal community nursed a sense of deprivation of their political and fundamental rights, ever since they had been declared a Scheduled Tribe in 2003 under Article 342 of the Constitution. By the Delimitation Act, 2002, the number of seats in an Assembly can be readjusted only on the basis of the first census after 2026. The Second Schedule to the Representation of People Act, 1950 and Section 5A of the Representation of People Act, 1951 have been amended to change the Assembly strength. 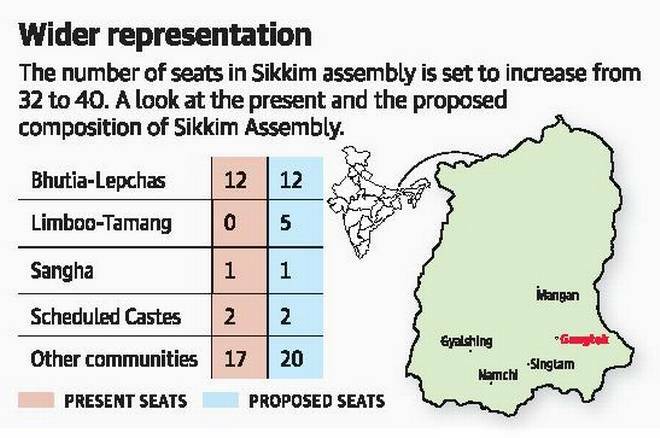 Sikkim has 12 seats reserved for Bhutias-Lepchas. It is not because they are a Scheduled Tribe, but as a sequel to a political agreement in 1973 between the Government of India, the former Chogyal (King) of Sikkim and political parties. The seats are being increased to accommodate the Limboo and Tamang communities, notified as Scheduled Tribes in January 2003. Of the eight new seats, five will be reserved for them. They are Kirati people indigenous and native to their homeland himalayas, hills, mountainous and plains regions. They are a community of people of Tibetan ancestry, who speak Lhopo or Sikkimese, a Tibetan dialect. The Bhutias are spread out over Nepal, Bhutan, and in northern West Bengal, especially in the towns of Kalimpong and Darjeeling. The Bhutias as recognized as Scheduled Tribes in the states of Sikkim, West Bengal and Tripura. They are among the indigenous peoples of Sikkim. In a parliamentary democracy, government can be in power only if it commands majority in directly elected House. Article 75(3) of our Constitution of India embodies this rule by specifying that Council of Ministers is collectively responsible to Lok Sabha. But there is no mention of a no-confidence motion in the constitution. The Rule 198 of Rules of Procedure and Conduct of Business of Lok Sabha provides mechanism for testing this collective responsibility. Rajya Sabha does not have procedure for moving of no-confidence motion against Government and also adjournment motion, censure motion. 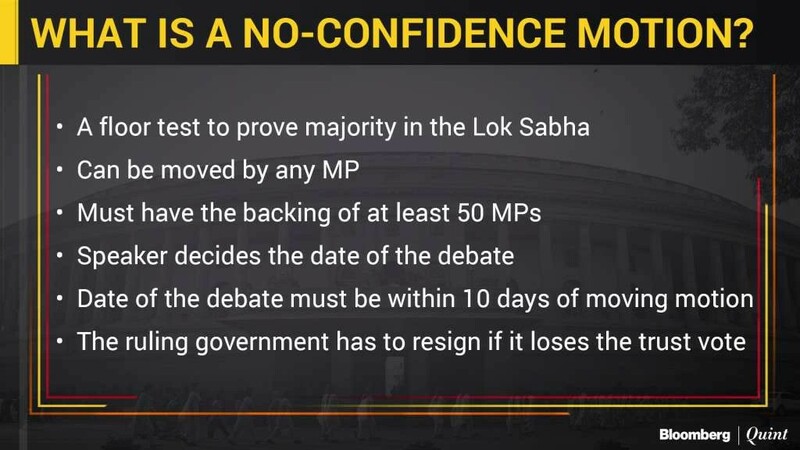 The rule allows any Lok Sabha MP who can garner support of 50 colleagues, to introduce motion of no-confidence against the Council of Ministers. Motion of No-confidence need not set out any grounds on which it is based. If there are 50 MPs in favour, the motion is admitted and speaker allots date for discussion on the motion. Thereafter, discussion on motion takes place. MPs who support motion highlight government’s shortcomings. Then Prime Minister or ministers reply to the charges made. If the government loses trust vote, it is expected to resign. 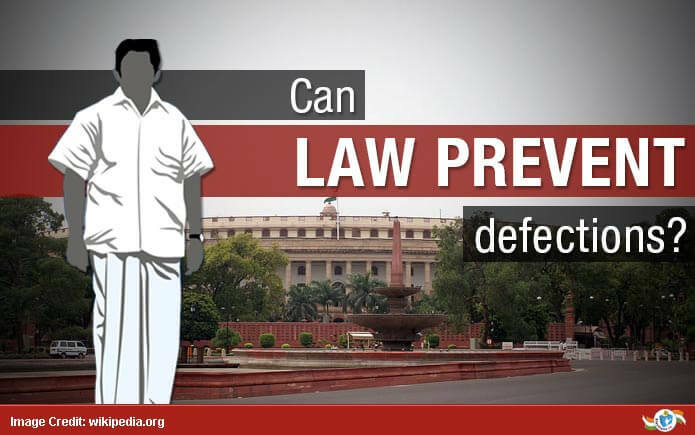 The anti-defection law was passed by parliament in 1985 strengthened in 2002. The 52nd amendment to the Constitution added the Tenth Schedule which laid down the process by which legislators may be disqualified on grounds of defection. Voluntarily gives up the membership of his political party, or Votes, or does not vote in the legislature, contrary to the directions of his political party. However, if the member has taken prior permission, or is condoned by the party within 15 days from such voting or abstention, the member shall not be disqualified. If an independent candidate joins a political party after the election. The decision on questions are to disqualification on ground of defection is referred to the chairman or the Speaker of such House, and his decision is final. All proceedings in relation to disqualification under this Schedule are deemed to be proceedings in Parliament or in the Legislature of a state. It omitted paragraph three from the Tenth Schedule that allowed one-third of the parliamentarians/legislators to split from their parent party. However, it left paragraph four in place, which allows two-thirds of the members of a parliamentary/legislative party to merge with an existing political party or form a new political party. Any person elected as speaker or chairman could resign from his party, and re-join the party if he demitted that post. The law succeeded in checking the regular phenomenon of unstable governments and horse-trading due to floor crossing by legislators. 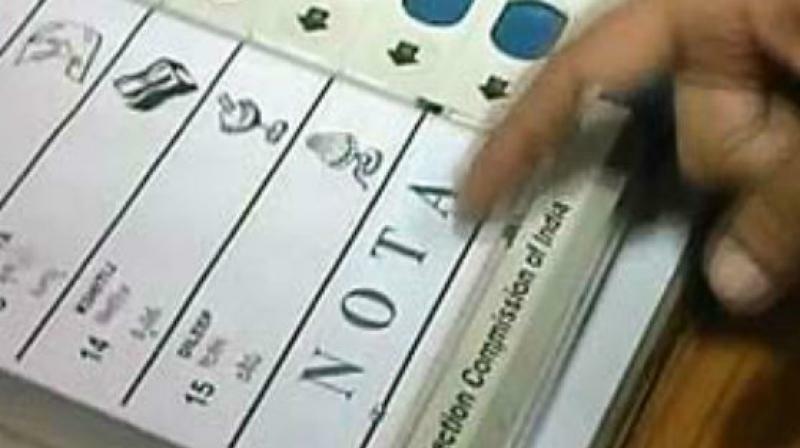 However, it played a huge role in encouraging the centralisation of India’s political parties. Legislators in India now cannot take a stand against party leaders or defy the party whip, and use their conscience to vote on a Bill in the House due to fear of losing their seat under the provisions of the Anti-Defection law. This has also the effect of dis incentivising lawmakers from seriously thinking, researching or even rifling for best practices to incorporate into legislation that is before the House for consideration and focus their energies on procedural matters. Also, a legislator cannot question the sweet deals or alliances between top party leaders. Does the law impinge on the right of free speech of the legislators? This issue was addressed by the five-judge Constitution Bench of the Supreme Court in 1992 (Kihoto Hollohan vs Zachilhu and others). The court said that “the anti-defection law seeks to recognise the practical need to place the proprieties of political and personal conduct above certain theoretical assumptions.” It held that the law does not violate any rights or freedoms, or the basic structure of parliamentary democracy. What changes can be brought in? The disqualification of a member of a House should be only on the grounds that if he votes or abstains from voting in the House with regard to a Confidence Motion, No-confidence Motion, Adjournment Motion, Money Bill or financial matters contrary to the direction issued in this behalf by the party to which he belongs to and in no other case. Whips can be issued only for those legislative items that threaten the stability of government. As recommended by the Goswami Committee, the government should consider giving the power to decide on disqualification under the Act to the President or the Governor, who shall act on the advice of the Election Commission. Disqualification of 9 rebel MLAs in Uttarakhand under anti- defection law has once again brought back discussions surrounding the law to the fore. Amar Singh and Jaya Prada, who were members of the Rajya Sabha and the Lok Sabha, respectively, moved the court on their expulsion from the Samajwadi Party on February 2, 2010, anticipating ouster from Parliament. As per the interpretation of the anti-defection law by the Supreme Court in 1996, a member elected, or nominated, by a political party continues to be under its control even after expulsion. They felt this impinged upon the fundamental rights of the expelled members, including their rights to equality. 18 AIADMK MLAs were disqualified by TN speaker owing allegiance to T.T.V. Dhinakaran.